... the cocktail part that is, not the turning 18 bit! I think those days are long behind me now, I'm afraid! So yes, this will be me on my friends hen weekend - my night time frock is even red too! Really looking forward to getting dressed up and going out for a good old boogie. It's been way too long! As you can probably tell though, this card wasn't actually made to mark my drunken weekend away. No, it was really an order from one of my colleages for her neice. Really chuffed with how it turned out though as I'm loving this paper and can see that I am going to get loads of use out of this fab image! Paper: 'Quite Contrary' by My Minds Eye, available from Dies to Die For. Copic Markers: E00, E11, E50, R20, R22, R27, BG000, W5, W7, Y21, Y28, YR23. Tools & Embellishments: Gems and computer generated sentiment. Righty-oh, I'm off to finish my packing. I'm also planning of packing Ali off to bed and then sitting down to watch 'New Moon' which landed on my doorstep today - even though it isn't officially released until Monday! Don't you just love Amazon pre-ordering?! Hope you all have a splendid weekend folks, I know I will! How fun Stacey what a fabulous image!!!! Perfect for a birthday! Its so bright, and i love the stamp! I bet your colleague is impressed with it! This is fabulous Stacey! I love this funky image! How did your DVD come so early??! I'm jealous although mine is on it's way after I pre-ordered on Play.com - can't wait! Have a fab time on the Hen Do! 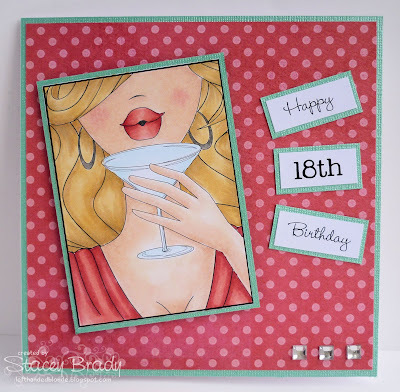 Oh this is fabulous Stacey, brilliant for a 18th card. It's fabulous Stacey! great colouring and the paper is gorgeous!